Here are some links to other websites that you may find of interest, or that might assist you in planning your cottage holiday in Northumberland. Kinloss Estate is a traditional Scottish Country Estate on the outskirts of Cupar, near St Andrews, in Fife. Northcliff House is a beautiful, early 19th century mansion house in North Queensferry, Fife with superb views of the Forth road and rail bridges. With eight fully equipped, self-contained self-catering holiday cottages and self-catering holiday apartments, Northcliff offers both short and long stay lets near Edinburgh. The Piggery is a luxury, 4 Stars Gold, self-catering holiday cottage for a couple in rural Herefordshire, just outside the cathedral city of Hereford. Abergavenny, Hay-on-Wye, Leominster and Ross-on-Wye are all nearby. Gloucester, Ludlow and Worcester are also easily accessible. Beacon Hill is a multi award-winning self catering holiday cottage complex near Morpeth in Northumberland with extensive leisure activities, including a health and beauty spa with swimming pool. Enjoy a self-catering cottage holiday at Brunton House and Holiday Cottages on a famous Northumberland country estate. Brunton House and Holiday Cottages are beautifully positioned midway between Alnwick and Bamburgh in Northumberland, close to the Heritage Coast. They are set on an organic farm in the middle of the 2,500 acre Fallodon Estate, next to an old water mill and overlooking a burn and lake, with views towards the sea and Beadnell Bay. Experience a luxury self-catering cottage holiday at Burnfoot Holiday Cottages in Northumberland. Located near Cragside and Rothbury on the edge of Northumberland National Park, our luxury self-catering holiday cottages make an ideal base for exploring the Kingdom of Northumbria. These luxury self catering holiday cottages are set in the 2,500-acre Doxford Estate near Alnwick in Northumberland. They are beautifully located close to Embleton Beach on Northumberland's Heritage Coast near the attractive seaside villages of Craster, Embleton, Seahouses and Bamburgh, with easy access from the A1. Superbly located next to The Tankerville Arms, a wonderful village pub and restaurant, Mill Cottage is a stylish, 5-Star Gold, self-catering holiday cottage for two in Eglingham, one of Northumberlands prettiest villages. 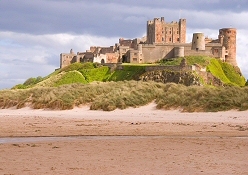 It is ideally located midway between Alnwick and Wooler. The Gables offers self catering holiday cottage accommodation in Aldeburgh, Suffolk, East Anglia. Comfortably sleeping up to fourteen, it's an ideal venue for family holidays, celebrations and reunions. Just an hour's drive from Edinburgh Airport, Drumkilbo is an historic manor house available only on an exclusive basis for your private or corporate house party in Scotland. Drumkilbo is also available for weddings and has a civil wedding licence.